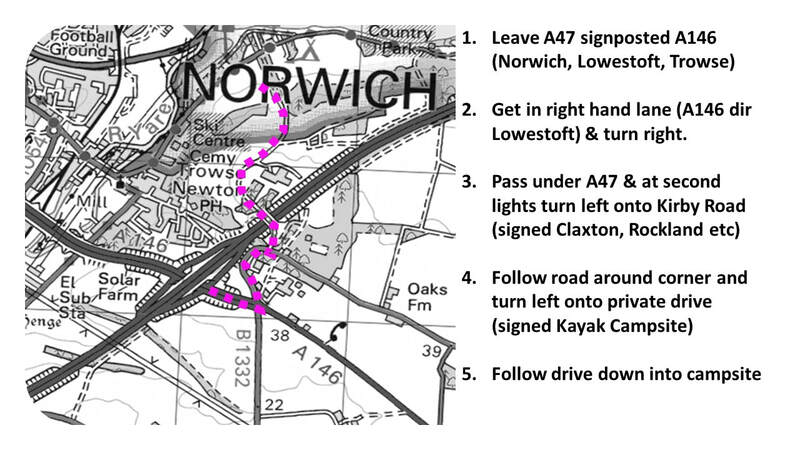 We are offering a special, temporary campsite to support the National Kayak Championships being organised by Norwich Canoe Club and held at Whitlingham Country Park on the 10th & 11th of August 2019. The temporary campsite is open on the 9th, 10th & 11th and is only available to kayakers and their familes and will run alongside our usual offer at Whitlingham Broad Campsite. The temporary campsite is a little different from our usual offer and has a simplified pricing & booking system, so please read the infomation below carefully before booking. ​The temporary campsite is located on Warners Park, a beautiful field immediately next to Whitlingham Country Park and our permanant home at Whitltingham Broad Campsite. The site is just a few minutes walk from Whitlingham Boathouses and the broads at Whitlingham, on the edge of the Coutry Park and a short walk from the village of trowse (15 mins walk) and close to the centre of Norwich (40 mins walk/15 mins bike). ​The temporary campsite offers good quality toilets (incluing one wheelchair accessible unit) and drinking water, but not showers (sorry). Shower facilities for race participants are avaiable at the Whitlingham Boathouses (a few minutes stroll from the temporary site). The Barn cafe and Whitlingham Tourist Information Centre are just 2 mins walk from the site. 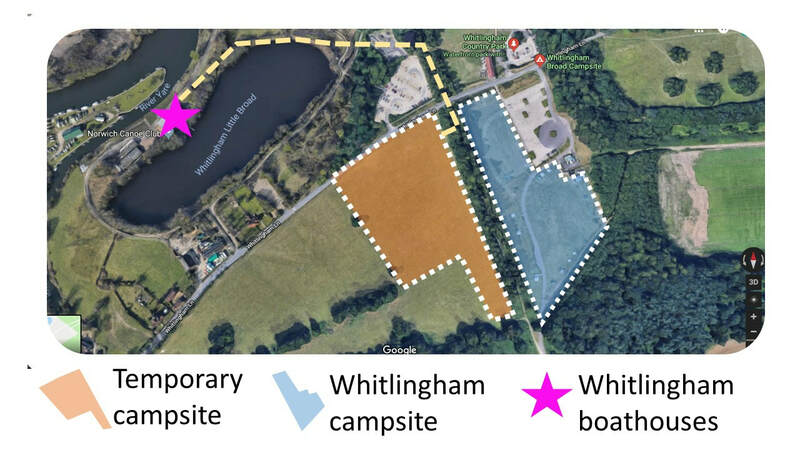 Please note that the facilities at Whitlingham Broad Campsite are not available to those staying on the temporary campsite. The price includes 1 vehicle per pitch, additional vehicles £5 for the weekend. No additional charge for trailers or caravans. ​Vehicle access to the site is NOT via Whitlingham Lane, but via the (very picturesque) tree-lined private drive leading from the Kirby Bedon Road down past Whitlingham Hall and onto the temporary site. Please see map below for details. Please note that pedestrians (and bikes) will be able to access Whitlingham Lane direct from the site, however there is no direct vehicle access onto the lane. You are welcome to leave one vehicle per pitch on the temporary campsite throughout your stay with us (additional vehicles £5 for the weekend), however please note that the weekend camping rate does not cover parking in any of the Whitlingham Country Park car parks. Staff will be available at all times and will be onsite to help ensure that everyone has an enjoyable weekend. All campers are asked to read and agree to our camping code: in summary, if loud music and large amounts of alcahol are going to be a key part or your weekend then sorry but we are not the right site for you. Fire pits are available to rent for the weekend and we sell good quality FSC hardwood, or you are welcome to bring your own pit and wood (all firepits must be raised off the ground so as not to damage the grass). To ensure all have a fun and safe weekend, anyone renting or bringing a fire pit will be asked to sign and agree to our simple campfire code. BBQs are welcome but no disposable BBQs please. In order to minimise disturbance to other campers please aim to arrive by 2230 - after this time we may not let you pitch (and so may have to turn you away) as your arrival is likely to inconvenience other guests. Rubbish and Recycling bins will be available at the site. We would appreciate your help in keeping the site tidy and minimising wate going to landfill. 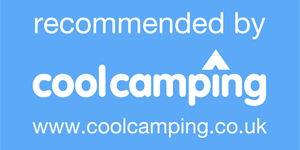 Bookings can only be made through this webpage or by calling the campsite on 07794401591. 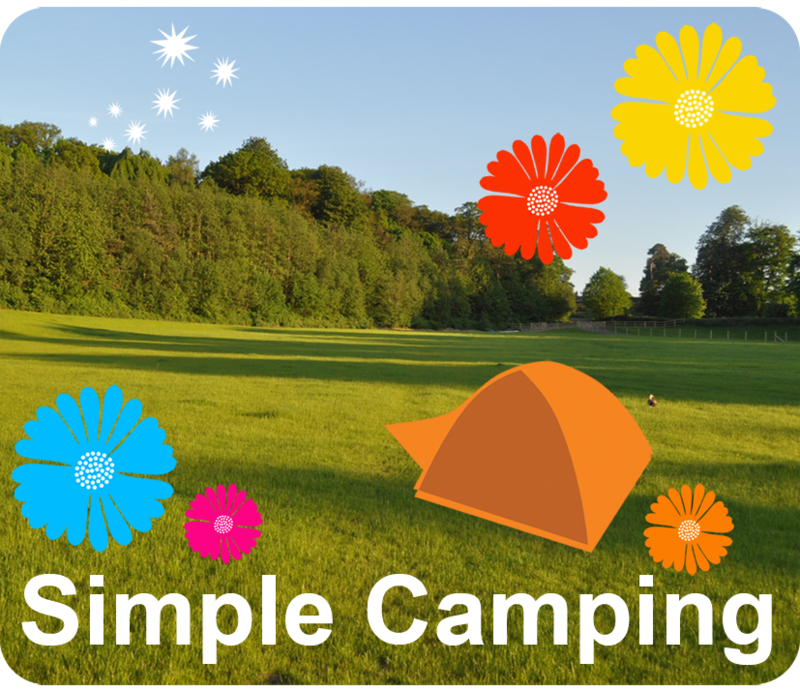 You can not book the temporary campsite through our normal booking chanels or any other site. To book please add the relevent number of Adult, Child and Dog weekend passes to your shopping basket by clicking the icons below. Then please follow the process through to our secure payment site. On receipt of payment you will receive a booking confirmation email which reiterate the information above regarding access, facilities, check in times etc. Please note that the name you enter to purchase the tickets will be the name of your booking. If you are making the booking on behalf of another please make sure they have your name to gives us on check-in. ​If you have any questions regarding the temporary campsite please contact us.